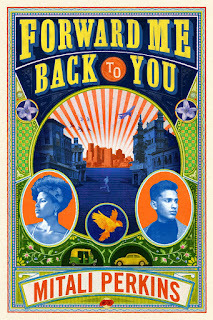 Mitali Perkins' newest YA novel, Forward Me Back To You, pulled me in with characters navigating their way through trauma and secrets. It is a book that wrestles with many heavy topics, yet the story shines with sweet moments and fully developed characters. The core of the story takes place in Kolkata, India as three teens travel to spend the summer helping an organization supporting survivors of human trafficking. And yet each of them realize that their personal stories, their backstories, impact the way they walk through the world. As the story opens, Katina King struggles to recover from a sexual assault at school by a popular boy. Although Kat fought him off using her training in martial arts, the school authorities don't believe her. In order to help her heal and move forward, her mother sends her to Boston to finish the semester with a family friend, Grandma Vee. I so appreciate the way Perkins brings readers into Kat's point of view. Right from the beginning, she introduces the way Kat sees people classified into types -- canines, felines and birds -- based on the way they act, react and treat others. "Katina King classifies herself as a mountain lion. She might have become a tame cat in a safer world. But when she was eleven, her body changed so fast it turned her into prey. Nothing she could do to stop luring canine eyes, so she’d put on a feral mask since then to prowl the hills of Oakland. They should have kept wolves away, but they didn’t." In Boston, Kat meets Robin (Ravi) Thornton, who's struggling with his own past. Adopted from an orphanage in India, Robin numbs himself to his own pain by keeping the world at a distance. When his church group leader suggests a summer service trip to Kolkata, Robin decides to take the opportunity, in part to see if he can locate his "first mother." Once they are in India, Robin asks to be called Ravi, his original name. The second half of the novel takes place in Kolkata, as Ravi, Kat and Gracie, Ravi's long-time best friend, work to support survivors of human trafficking. Kat and Gracie work in a shelter, while Ravi helps with data entry and trains with a local policeman. Perkins shows the complicated aspects of volunteer-tourism, and yet she also shows clear love for the city of Kolkata and the value of connecting across cultures. Perkins excels at weaving together characters. Main characters and secondary characters have full backstories that create multidimensional, relatable people. The characters of Bontu, Miss Shireen, Kavita and Grandma Vee will stay with me. Perkins explores heavy, important issues of identity, trauma, international adoption and human trafficking, yet the characters' journeys and growth remain central. "This search for identity and recovery is a sweeping saga that explores the serious problem of international human trafficking. Gripping storytelling, eye-opening adventure in a faraway city, Forward Me Back to You packs an emotional gut punch that lingers long after the final page. A story not to be missed." The review copy was kindly sent by the publishers, Farrar, Straus and Giroux / Macmillan. If you make a purchase using the Amazon links on this site, a small portion goes to Great Kid Books. Thank you for your support.